It’s been so long since I’ve done a book post! Well, let’s face it. It’s been a long time for any post. Anyway, I’m back and hoping to get back to my regular schedule of posting. Typically on Saturdays I do a post with reading suggestions. Each of my children tells me one book they’ve read in the past week or are currently reading and why the recommend it. I realize not every family is the same. What I allow my children to read may not suit your standards and vice versa. But I’m hoping you can find something for your family to enjoy. Today I just want to talk about one set of books. I believe I’ve mentioned before that my middle son is dylexic. He’s nearly ten and still not reading at grade level. In fact, I’d say he’s struggling along at an upper kindergarten level. We lost ground over the summer and fall with all of the upheaval in our life. However, for the past month we’ve been able to consistently work on his reading, and I’m seeing improvement. One set of books has really encouraged him because they are phonetic. Being able to read these books boosts his reading confidence. My six year old loves them because they’re right at his level. 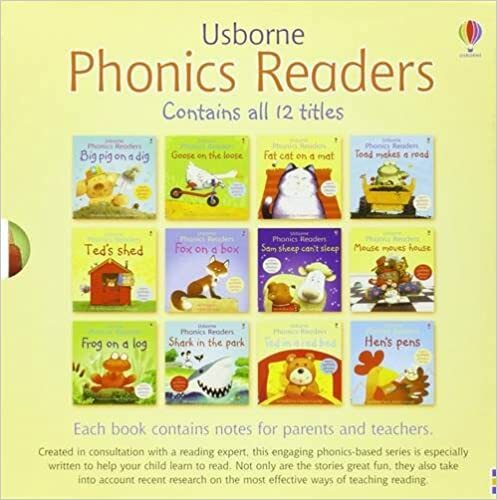 They are the Usborne Phonics Readers by Stephen Cartwright. Last summer while I was in Costco I passed by the book table (as I like to do) and saw them in a boxed set. Previously we had checked out individual books from the library, but this is a set of twelve books. Micah loves them. They’re not too long to tire him out reading the whole thing. They’re phonetic so he can read all of the words with little help as long as he takes the time to sound them out and not guess. As an aside – Why do children try to guess? They know I’m going to call them on that every time. Frustrating for both of us. Anyway, if you have a beginning reader or one who just needs the confidence of being able to read a book on his own, get this set. Micah’s favourite book is Ted in a Red Bed. So now it’s your turn. Does your family have a book or set of books that has helped your children learn to read?